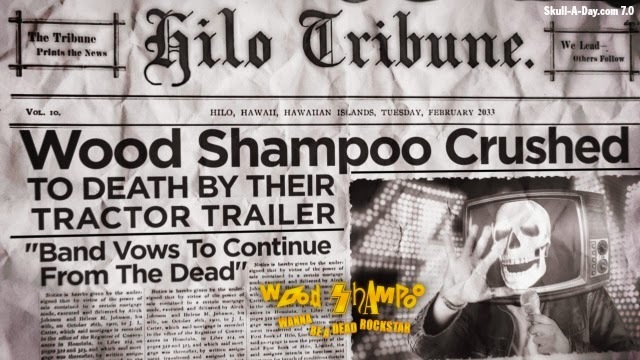 NYC band, Wood Shampoo, have a death themed music video to accompany their song "Wanna be a Dead Rock Star". 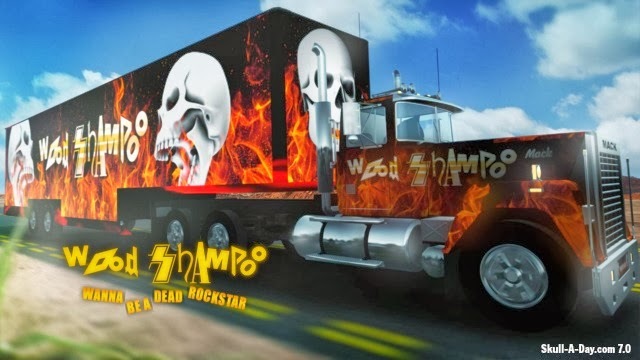 The digitally animated video features a singing skull riding a skull adorned tractor trailer. 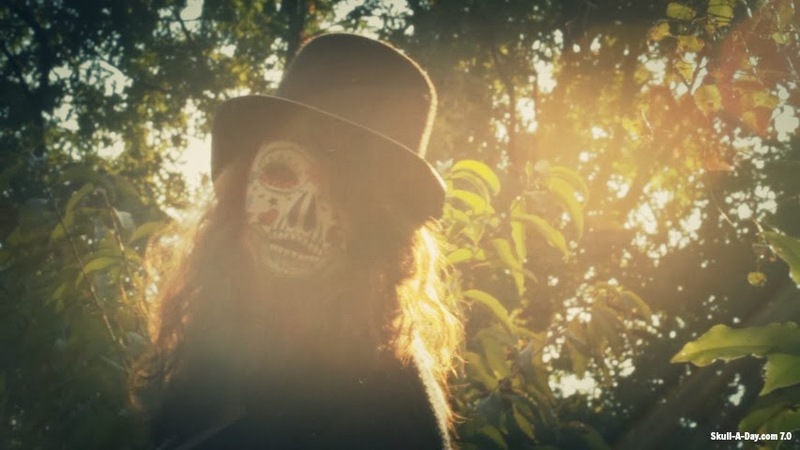 Murph Daniels sent us some stills from the video. You can watch the video, below the photos. To see what else Wood Shampoo is up to, check out their website, YouTube, and Facebook page. 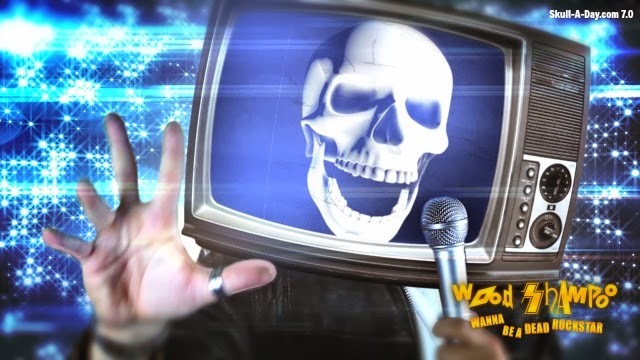 Their music video, "Wanna be a Dead Rock Star". Jak Flash, of Bristol, England is a photographer and art director. I came by him by seeing his incredible makeup tutorials on YouTube. 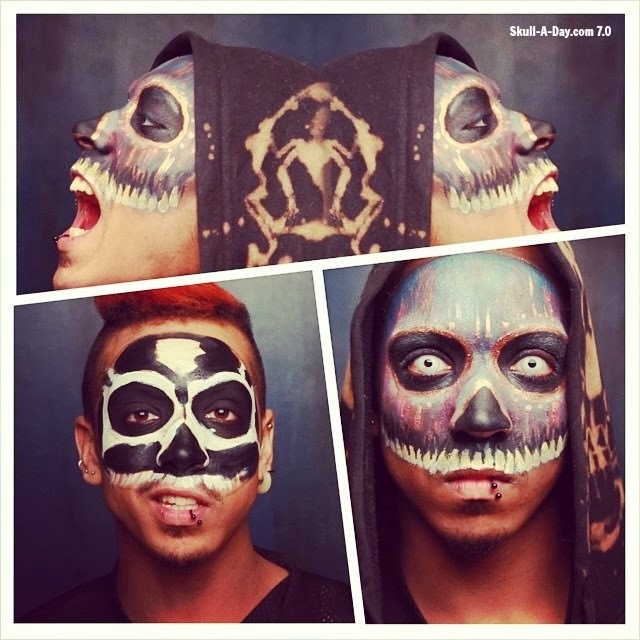 This Skull Mask Makeup is part of mask series he did. 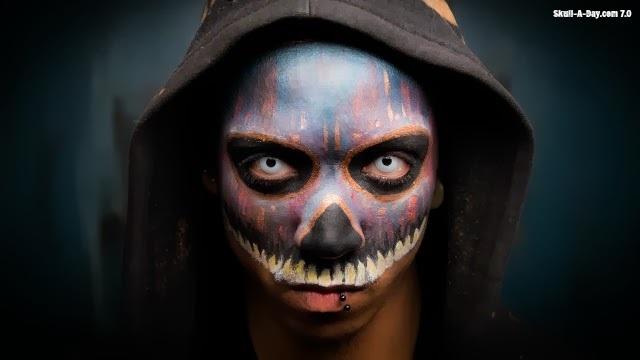 This skull makeup has colorful and metalic streaks through it, which gives it a painterly quality. 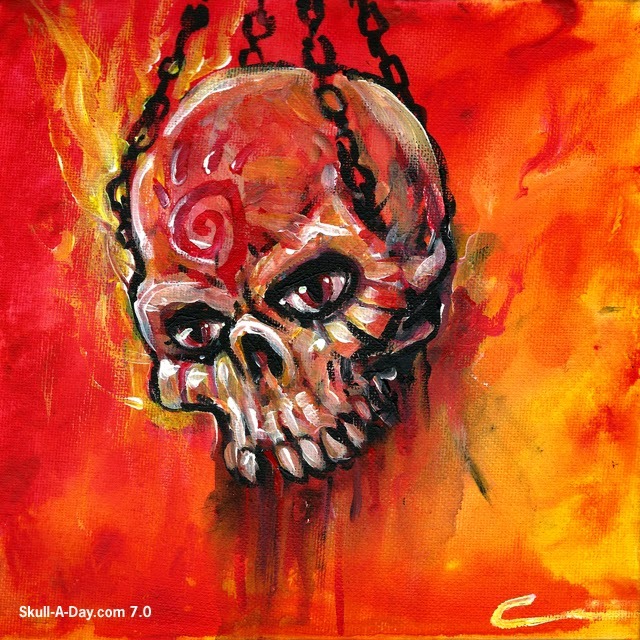 You can see more of Jak Flash's work on his Website, YouTube, Tumblr, and Facebook. Here is the Skull Mask Makeup Tutorial and the mask in action. Liverpool, U.K. must be the most undead place on Earth. It's home to Chris "Zombieking" who is the BRAINS! behind these two colorfully undead paintings. 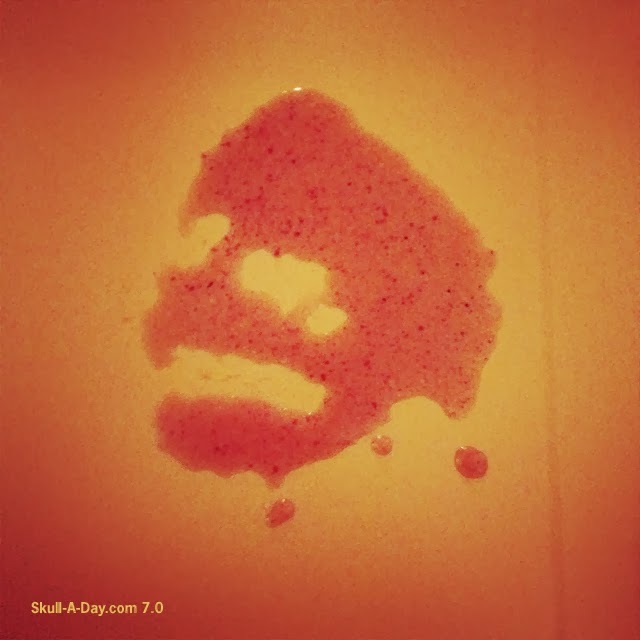 The first shows a glimpse of the "dark" side of being left to a burning eternal damnation. The second reminds me of a some kind of totally stellar Grateful (un)Dead poster. 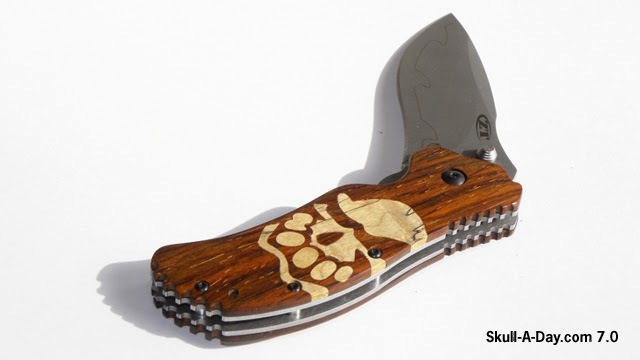 Each of these pieces is killer for their own reasons, and we thank you for sharing them with us, Chris! 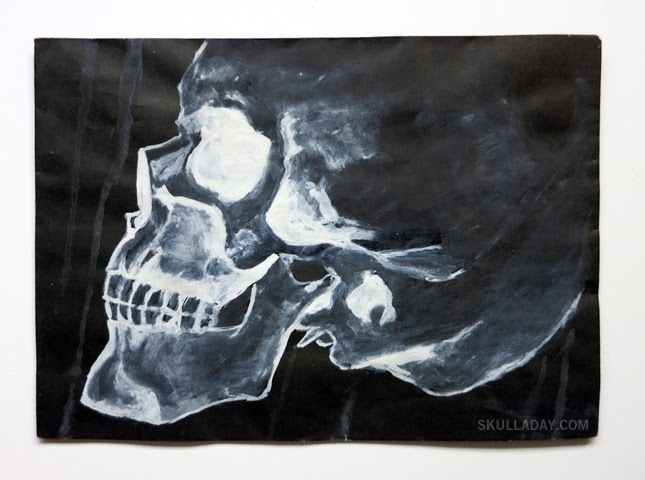 Today's skull is from Kayleigh Sparks of the UK. She submitted this for Valentine's Day, but unfortunately we did not get to it in time. 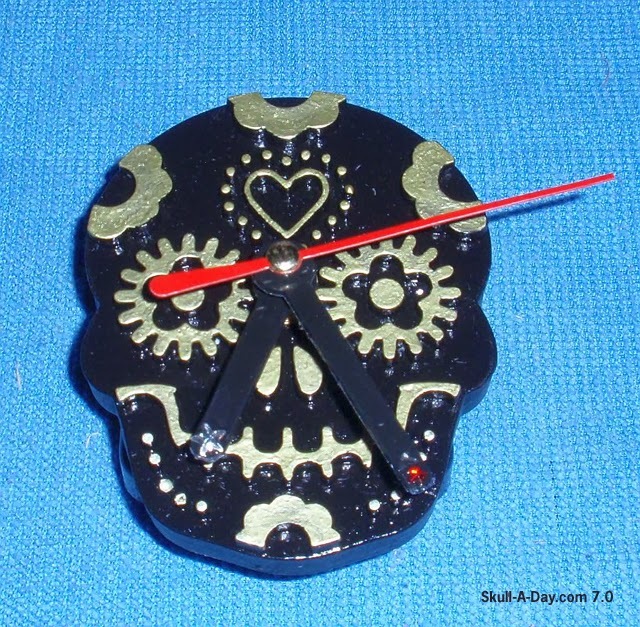 Luckily, we show the love for skulls EVERYDAY here on Skull-A-Day so this is a perfect piece for any day of the year. Thanks for sharing the love with us, Kayleigh! 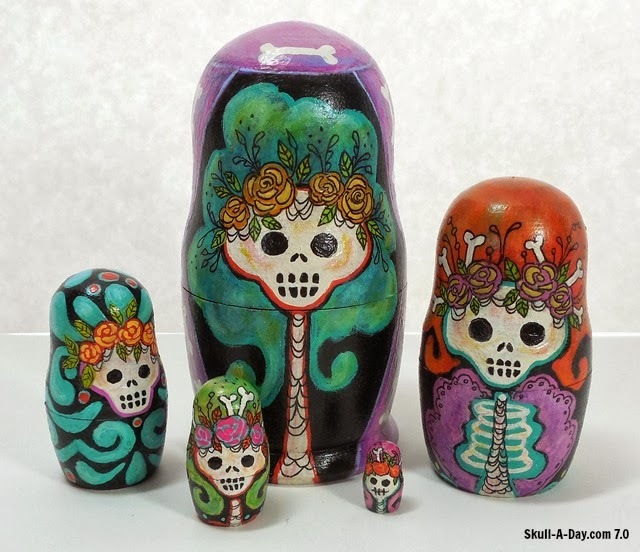 Leigh Hannan, is back with a set of painted Skelly Nesting Dolls. 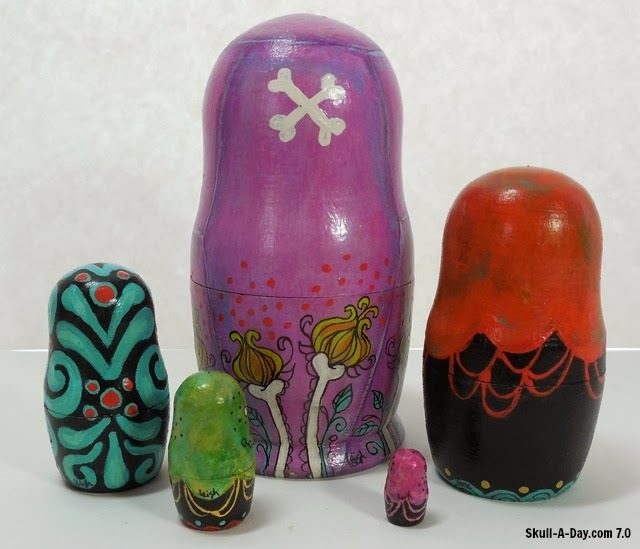 The littlest stands at just .5" high and the biggest is 4" high and just over 2" wide. 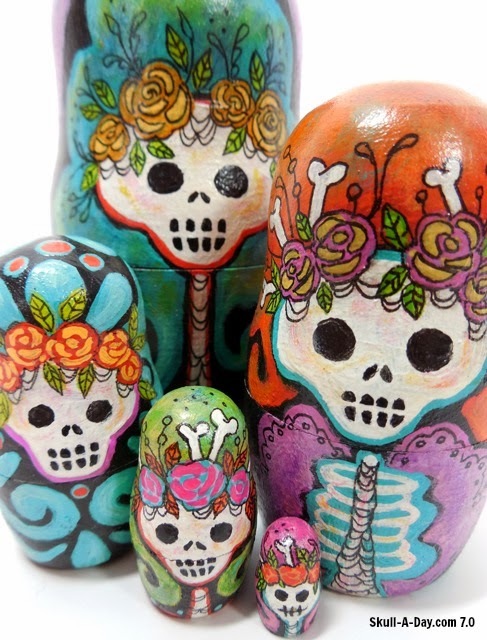 She explained, "These lovely ladies were made in Russia, and shipped to me for painting. Four have big, fun, colorful hair (some with bones tucked in! ), and all have flowers to adorn them. 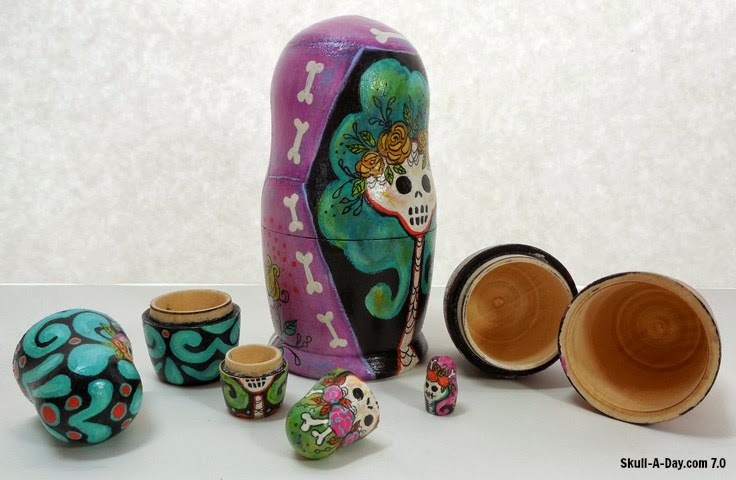 The biggest is nestled in her purple coffin with bone yard flowers all around, and the middle doll is set amongst a damask design." 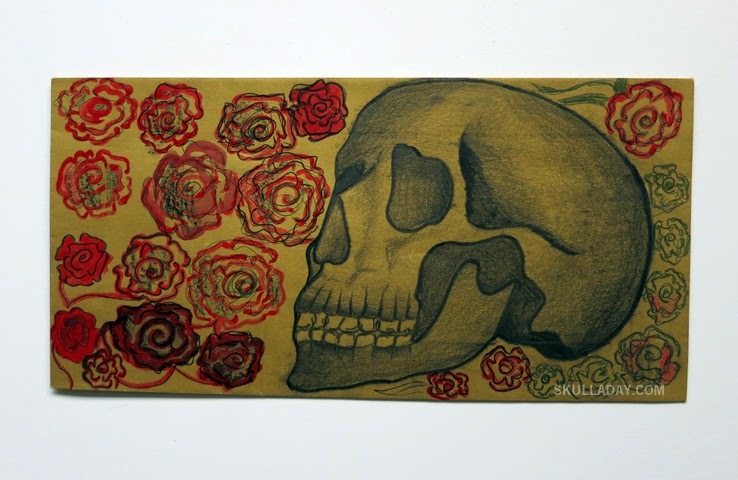 These are great pieces of artwork, and available for purchase in her Etsy shop, Skelly Chic. You can find out what else Leigh's creating on her Facebook page. Today's simulacrum will have all of the meat eaters out there ready to fire up their grill and get to some sizzlin'! 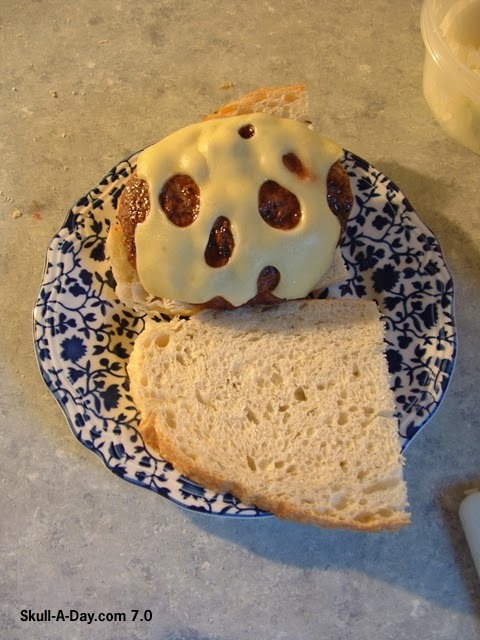 The first mouth watering find is from Kenny O. who is making his "attempt at Swiss cheese infamy". The second is from Kevin McIntyre of Raleigh, NC. Kevin found this unexpected dinner guest staring up at him after he prepared his hamburgers. I enjoyed both of these so much that I feel like I should include a salad simulacra just to balance things out. Thanks for sharing your juicy discoveries with us, Kenny and Kevin! 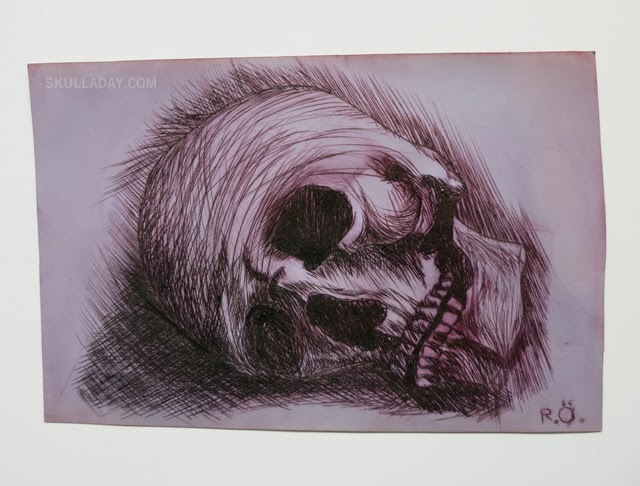 Remember to submit your own hidden skull finds if you have the chance. 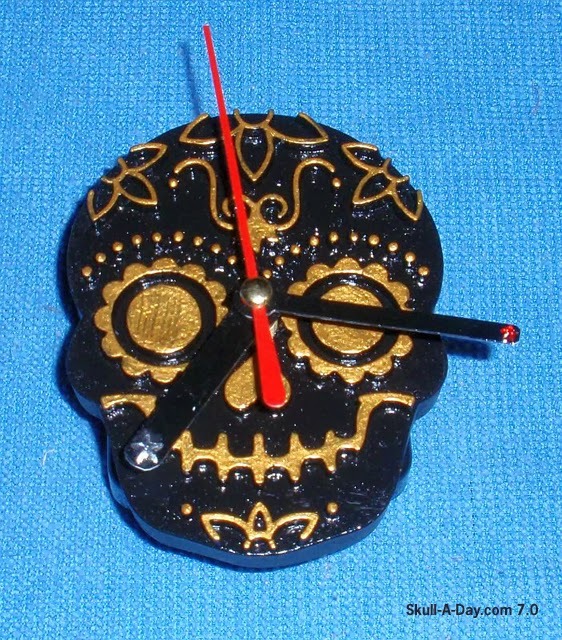 These killer skull clocks are from Bat Fastard of the U.K. 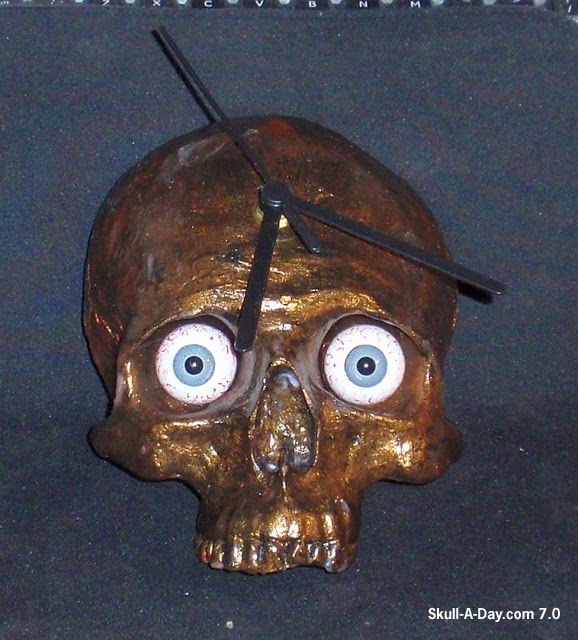 He's back from the past with a new set of painted skulls. 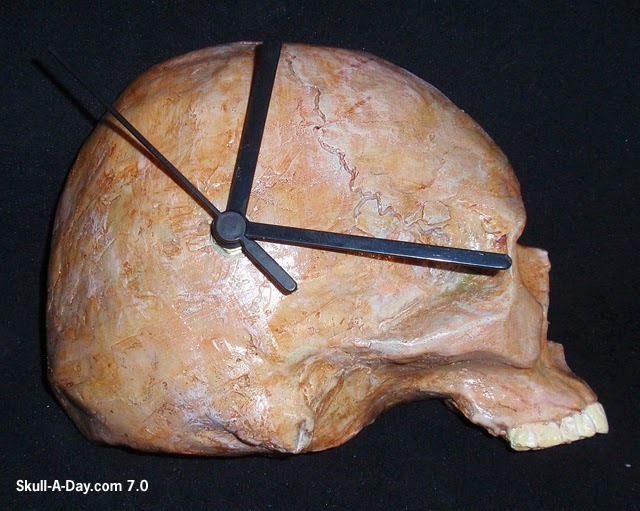 Never mind the fact that time doesn't really exist, just appreciate the fact that you are in the here and now enjoying some cool looking cranial chronometers. 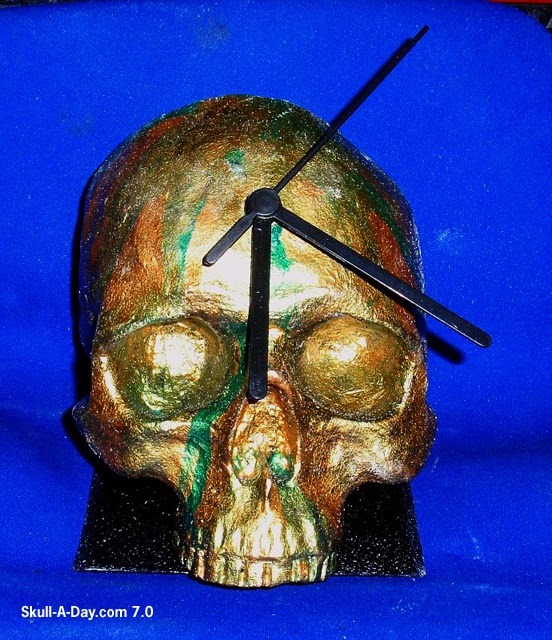 Thanks for making some "time" for us with your submission, Bat Fastard! 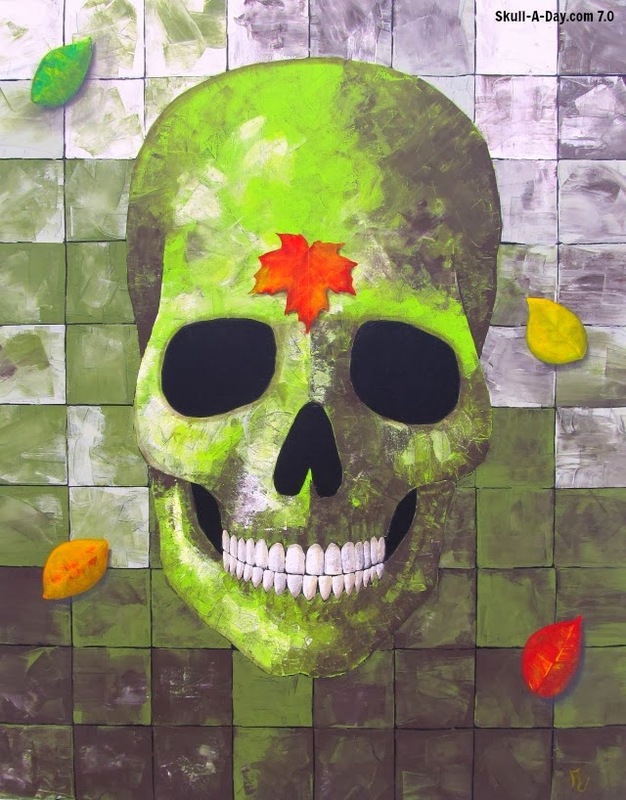 Adrian Edgar, from Mexico, has set out to paint 400 Calaveras (skulls). He predicts it will take him 33 years to complete, but what a beautiful 33 years that will be. I love seeing people challenge themselves creatively. 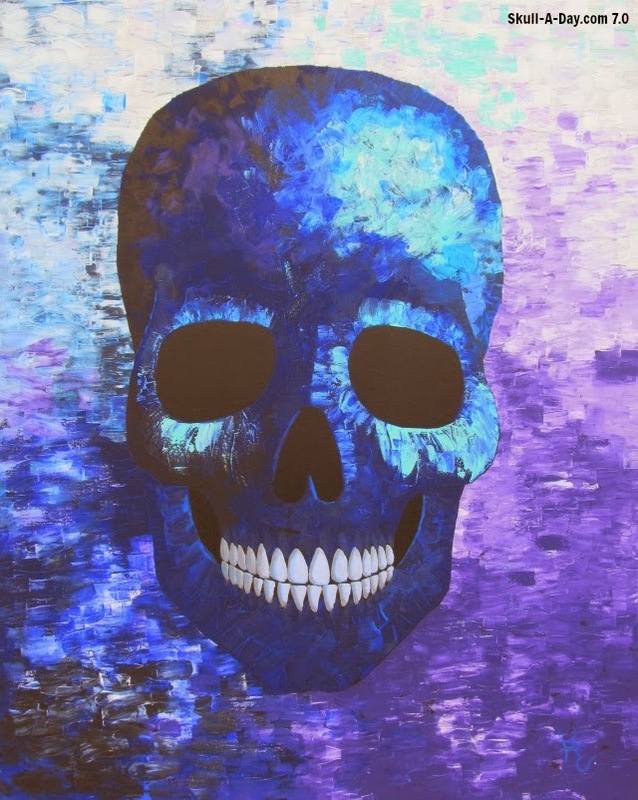 A challenge like this refines his painting skills and creativity. 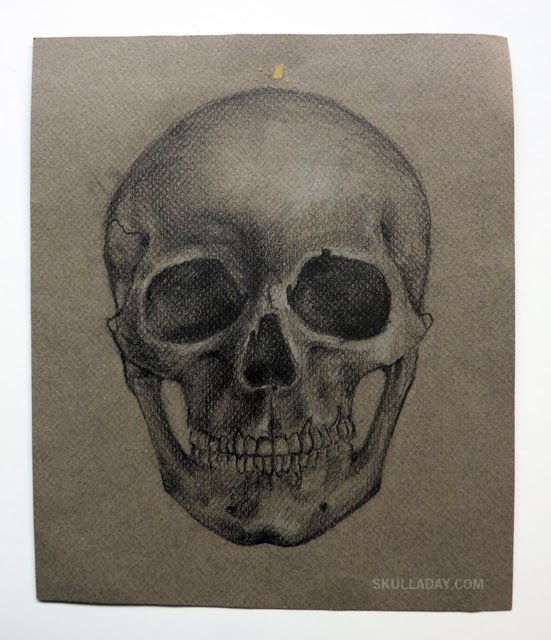 If you are familiar with Skull-A-Day's origins, you know Noah Scalin spend a year creating a skull every day. Since then, his skull count is at 423+. Set a creative goal for youself. 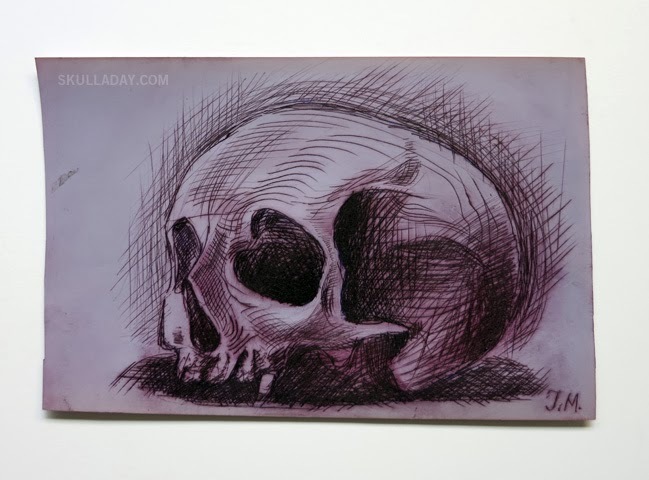 If you make some skulls along the way, make sure to submit them to us. We wouldn't be still going in year 7, without the creativity of our fans. 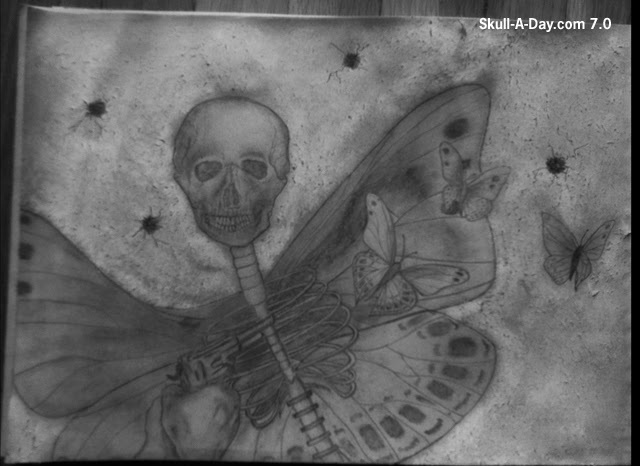 You can track Adrian's progress on his 400 Calaveras Facebook page. 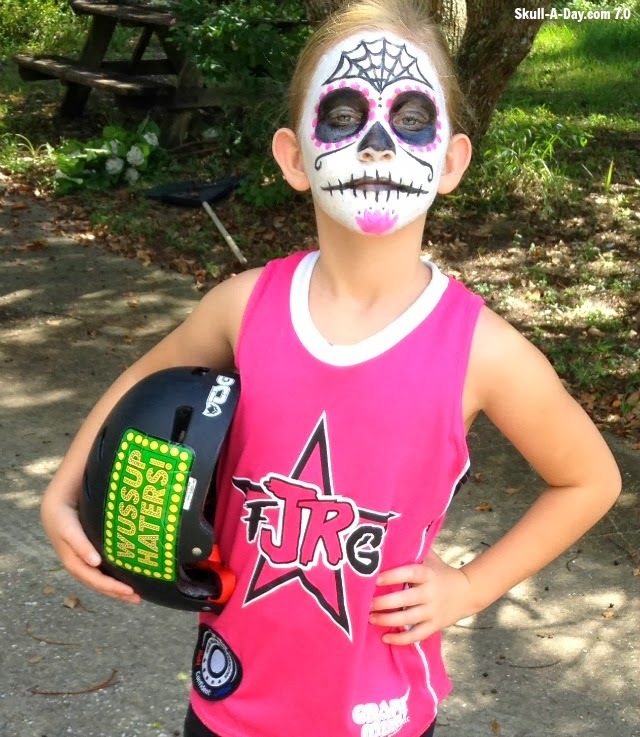 Julie Linebarier Reilly's 8 year old daughter "Tiny CrusHer", plays Jr roller derby with Florida Junior Roller Girls. She wore this skull makeup for one of her games. If I was in roller derby (I can't skate though), this would be intimidating...or just really distracting. Glad to see young girls getting into a rough sport like this. By the group photo on their Facebook page, it looks like they have a blast! Dearly beloved, we are gathered here today to celebrate the union of these two skulls as well as the art of Mike Leemann. 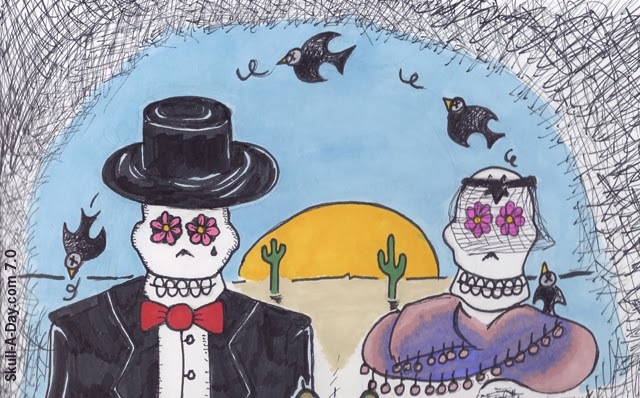 This fun drawing from Mike has me wondering if this couple will still include "til death do us part" in their vows. Either way, they are destined to spend an eternity together on paper. 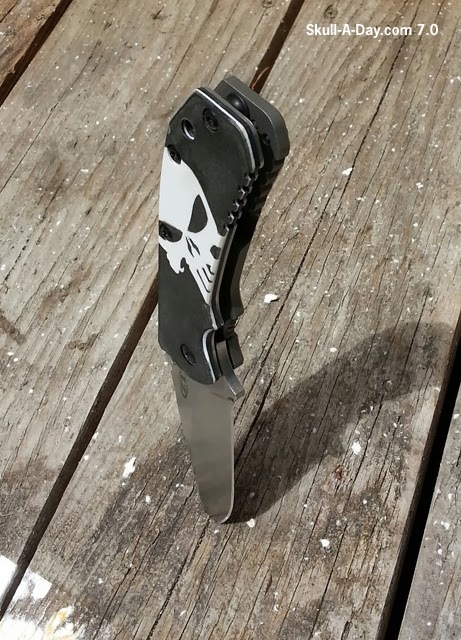 Thanks for the submission, Mike! 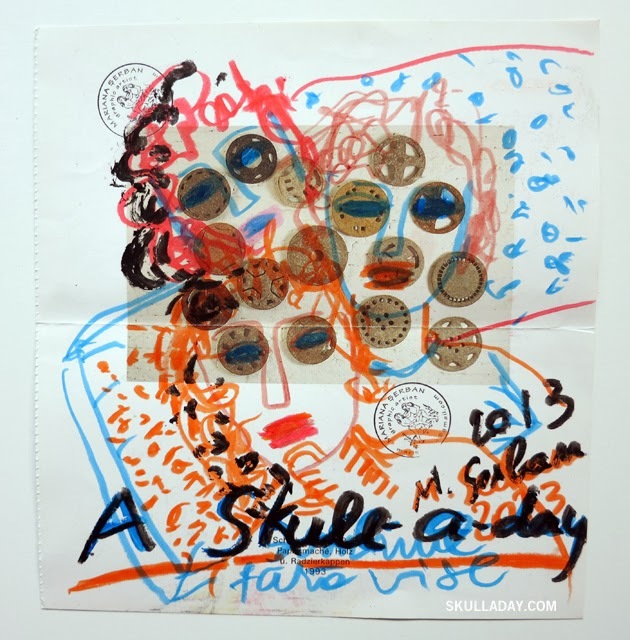 This drawing is from an artist known as 'Short Fuse Lies' located in The Netherlands. There is a lot of drama felt in this piece. I can't help but think of a certain mid-90's song either. One that carried a lot of drama with it as well. Colorless and losing life, this skull is a grim reminder indeed. Don't let life shoot you down. Thanks for sharing your work with us, Lies. 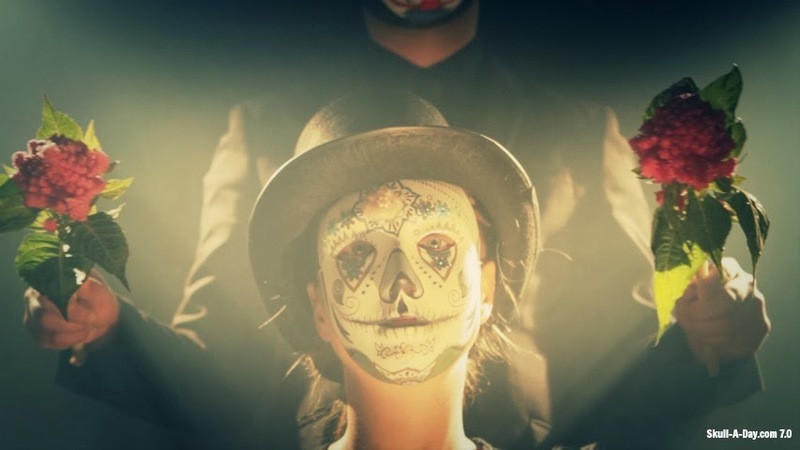 Lukasz Pytlik, from Poland, created this Dia de los Muertos inspired music video. It was for the Edward Sharpe and The Magnetic Zeros music video contest. I love the use of skull masks to unify the characters. You can see the video below the still photos. 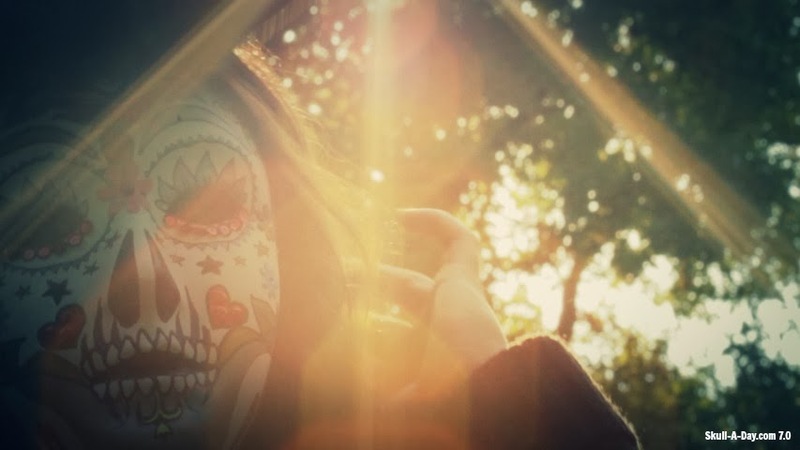 The music video, for the song "Please" by Edward Sharpe and the Magnetic Zeros. 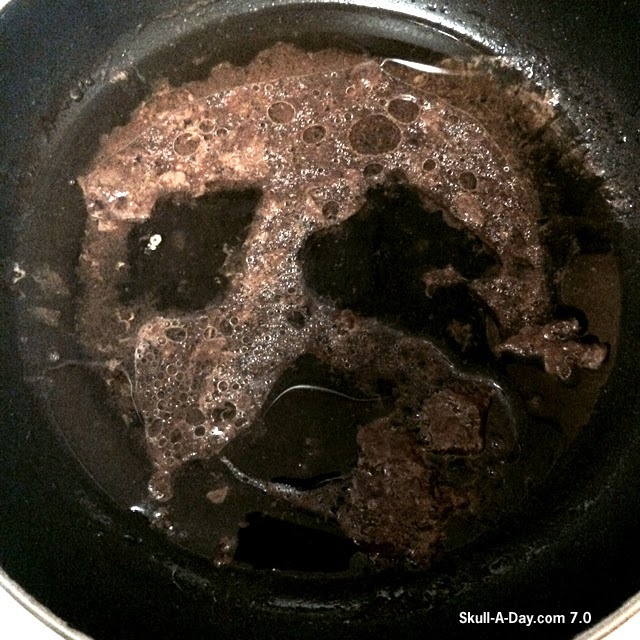 Kim Wirt was surprised with a visit from this saucy skull that formed in her BBQ vinaigrette after Christmas dinner. I hope this tastefully tangy simulacrum left room for dessert. Thanks for sharing this with us, Kim. 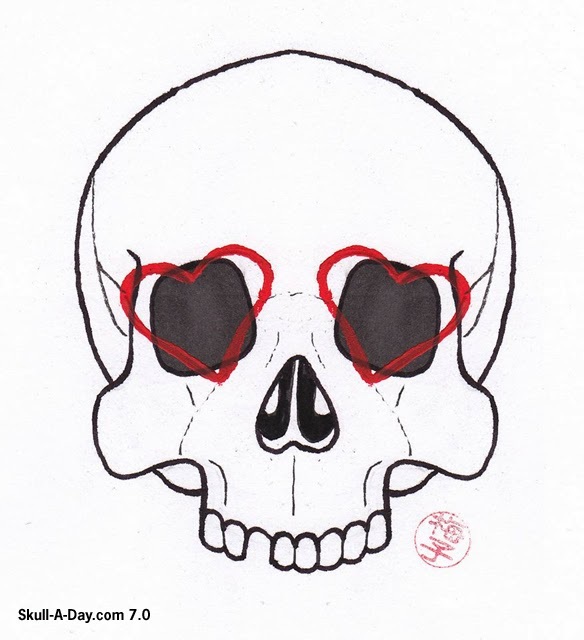 And don't forget to submit your own sneaky hidden skulls if you're lucky enough to find one. 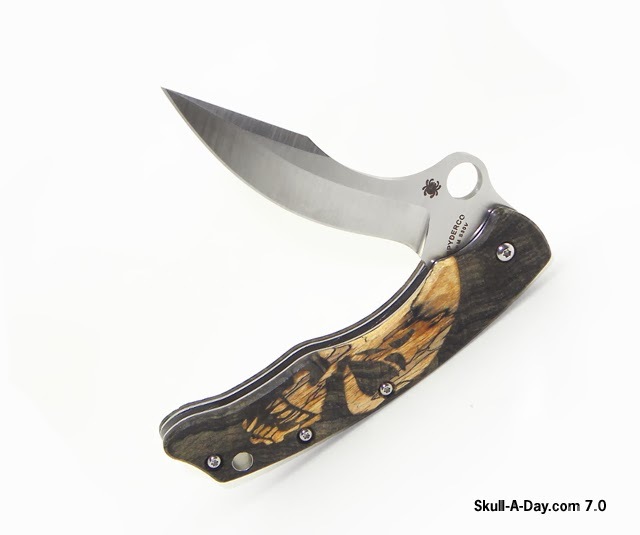 This collection of wonderfully made knife handle inlays is courtesy of Hal Henderson. 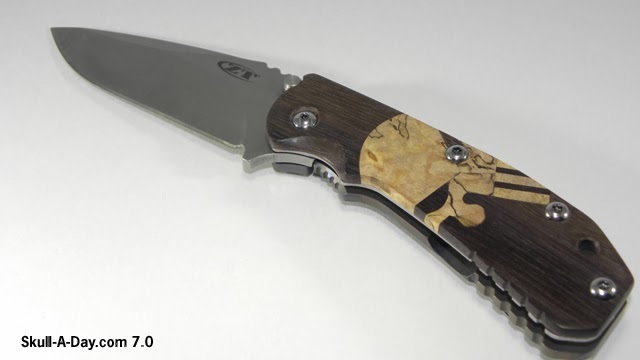 These magnificent looking pieces of wood are handcrafted and then mounted to various blades. 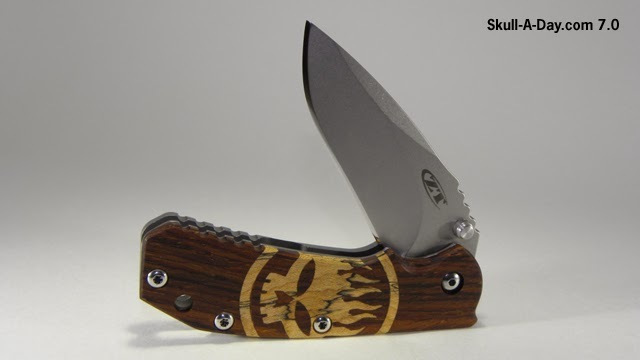 The true work comes in the inlays and the choice of woods to use. The right combination of woods will help to enhance the overall color scheme of the piece just as painters would mix their colors. 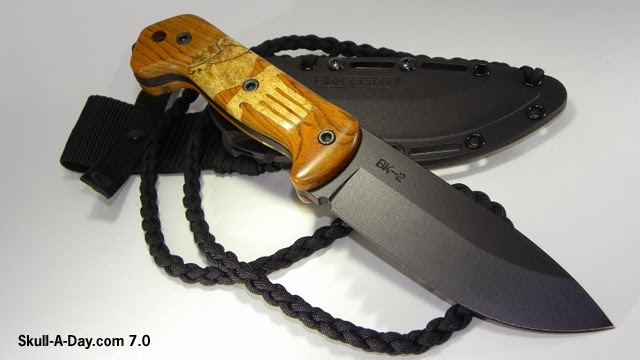 A durable piece of art to be handled with care. Thanks for sharing these, Hal! 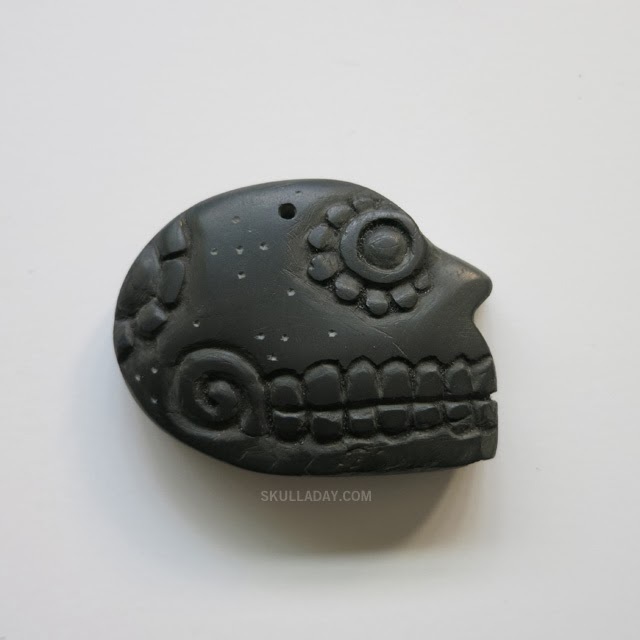 Starlingear Skull Bead - "Bullet Tooth"
I love sharing the wonderful skull gifts that I'm given from time to time. This pieces was sent from my friend Nashaili in Mexcio. It's hand carved from slate gathered in the mountains of Oaxaca and I'm told the artist who made it was inspired by the prehistoric iconography of her ancestors. 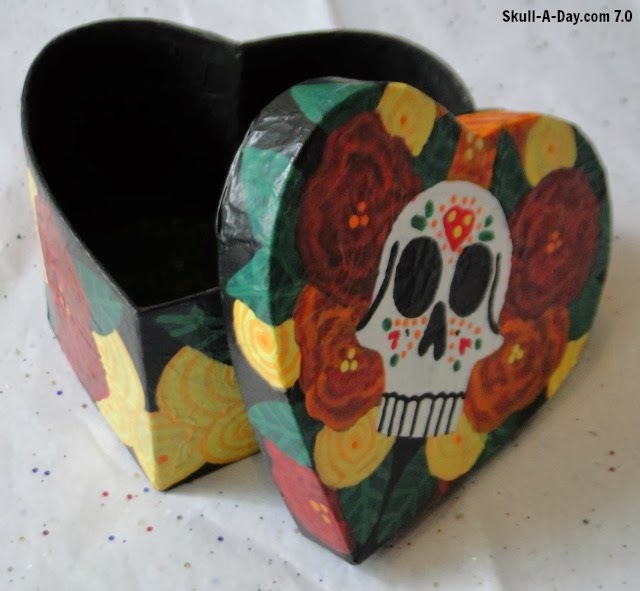 Inspired by Valentine's Day and Dia de los Muertos, I took a heart shaped box and transformed it into a dark Valentine box. I covered the box with tissue paper, to give it a faux leather look. 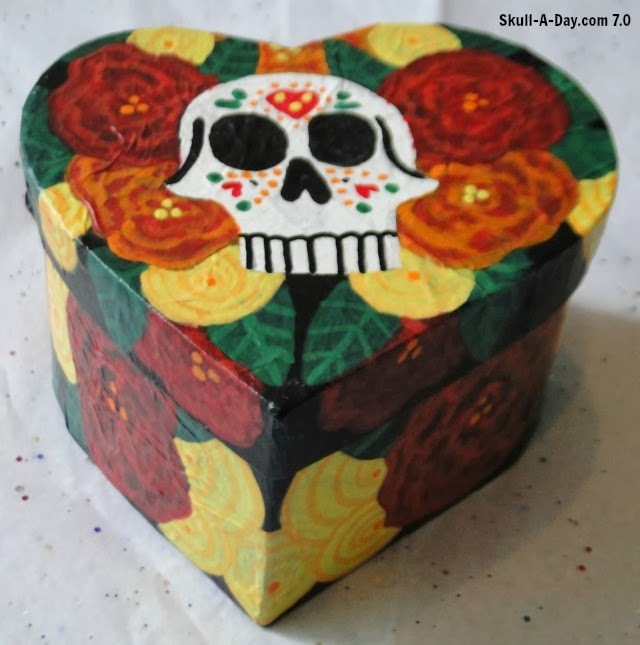 I painted a sugar skull, flowers, and leaves on the box, as a way of personalizing it. This box would be great to contain mementos, gifts, treats, or a shrine. Head to my blog to learn how to do the faux leather tissue paper treatment and see photos of the anatomical heart box. 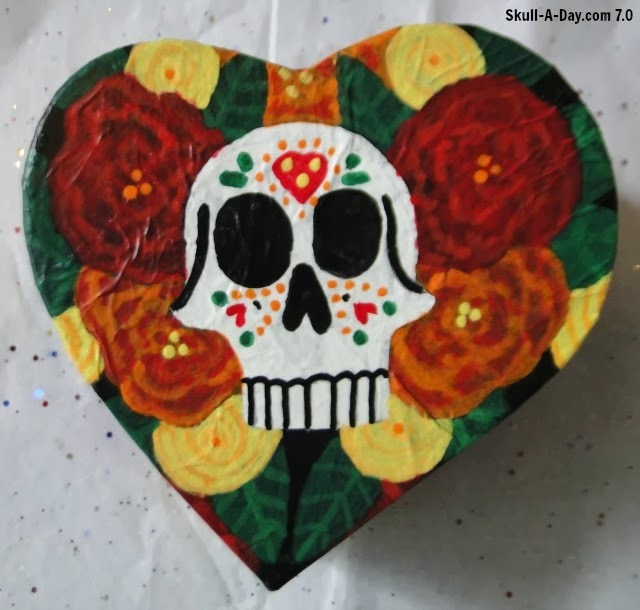 For the artwork, check out the Sugar Skulls and Marigolds Sneakers Tutorial. To see what else I'm creating, follow me on Facebook, Twitter, and Instagram. This 2 for Tuesday is courtesy of Poohvis Thanathammakoon in New York. 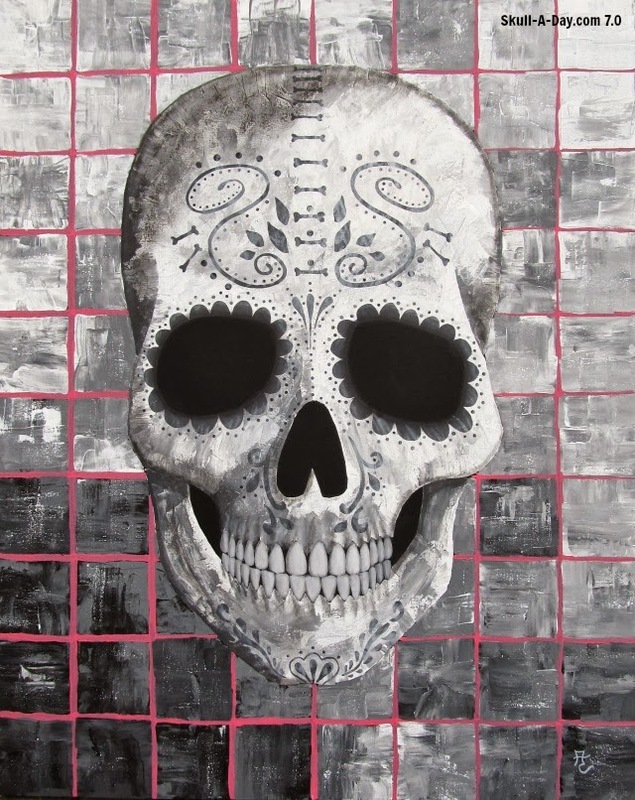 I'm loving how these geometrical skulls are so well planned out. I can't tell if I'm looking at a flow chart, a wiring schematic, or some sort of tribal decoration pattern, but regardless of what they look like I'm a fan. Thanks for sharing these, Poohvis! See more on Tumblr & Instagram.